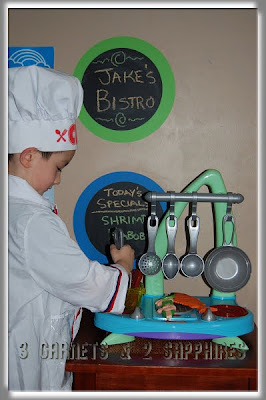 I chose this toy stove from International Playthings to feature as a "TWINtuitive Product" because it is extremely compact compared to freestanding kitchens, but still has enough room for two little chefs to cook on two burners and one grill. It is also much more affordable than a full size toy stove. 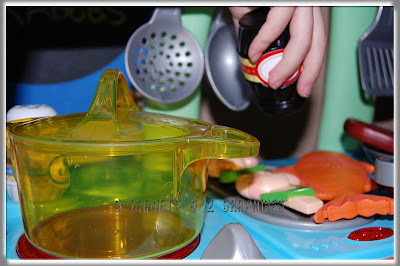 If you think cooking in a real kitchen is fun and promotes bonding, then you know two children will reap the same benefits cooking, sharing, and using their imaginations together. 1) I definitely like the compact size of this stove. Space is not something we have to spare, so the size of this stove works out very well for us. We have it sitting on a 4-legged end table, so we still have room to store other toys underneath. 2) I also like that the stove comes with enough accessories to start playing right away. 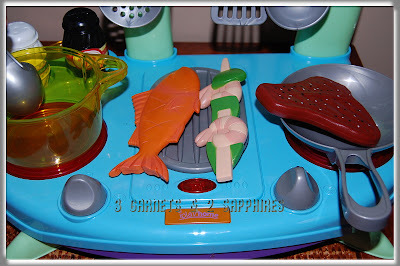 The fish, steak, and shrimp kabobs that come with this set are perfect for frying and grilling, but I would have liked to have seen one or two smaller things that would fit inside the pot. 3) It is difficult to see in the photo, but the two burners and the light in front of the grill actually light up when the stove's knobs are turned. These lights are accompanied by a realistic sizzling sound, thus the name "Sizzlin Stove". These features truly delighted all 3 of my children. 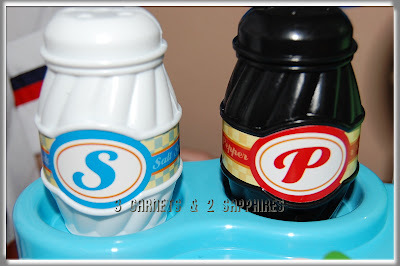 4) I find the self storing cooking utensils and condiments to be a nice feature. We can actually put everything away neatly on the stove without having to find homes for any of the pieces. This toy is well-built and should last my children a long time. 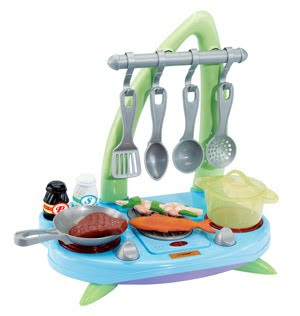 We do use other food sets in conjunction with this stove because the foods that came with this toy are too "normal". My children like to make things like grapes, corn, and peanut butter soup. To find more iPlay products and other quality brands of toys, such as Tomy and Early Years, visit IntPlay.com . 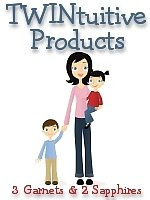 Thank you to International Playthings for providing us with a review product free of charge.